Meet my (assumed- must confirm this with grandparents) great uncle, Paul .S Melia, a Ball gunner of a B-17 bomber that served over Europe in the 401st Bombing Squadron. 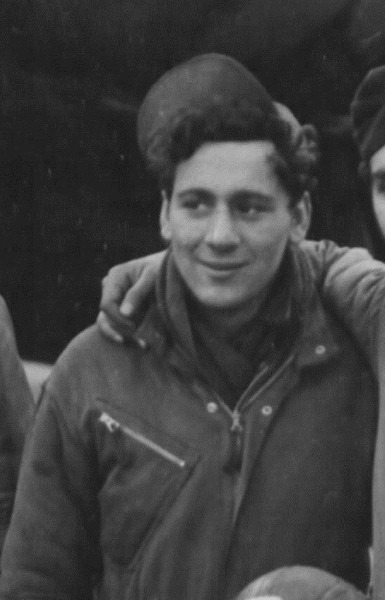 His first mission was on December/24/1943, in which his crew took to the skies at 12:00 AM. His officer leading the bombing run was Major William .T Seawell. There were no casualties and the Bomber squadron sited and/or bombed a V-1 rocket site near Gorenflos, in Pas de Calais region of France (have not gotten a lot of detail). They returned at 1604 hours or 4:04 pm. I could imagine a joke was gonna be made if they made it back at 4:01. His last and possible luckiest mission was on July/8/1944 which was led by Capt. R.H. Kaufman "E". The clouds made it hard for the Bombers to make out the targets but they still had good hits. An ME-110 was spotted near the group by my great uncle who kept his eyes and dual 50. cals on it. However the German pilot i guess was too chicken to attack and the flak that was firing was terribly in-accurate thanks to the cloud cover. The results were no casualties, only some scratched paint and maybe a thin gash in one of the bomber's lower fuselage. SGT Paul .S Melia was debriefed a few weeks later and was sent home (or so i have been told). I do not know about that because i never really did get allot of detail. Last edited by DallasMVeneto on Sun May 03, 2015 8:01 am, edited 1 time in total. I also have a few other ancestors who served in the US Military. One of them was a sailor in the US Navy who served in a shipyard in Okinawa. His biggest injury was shrapnel that flew through his lower leg, leaving a big but survivable wound. He managed to fire 6 or 7 rounds out of his M1-Grande that he shot at a Jap and killed that Jap with. He was awarded purple heart and a few other medals before he was sent home after the war. If anyone can find a picture of him i would be very grateful for he died a year ago and i could not find any pictures of him. On his 24 mission. S/Sgt. Paul S. Melia's B17 was shot down and captured in Germany. He was a POW for two years in Stalag17b---He was liberated by the Russians. Hello, I am Paul S. Melia's oldest son, my name is Anthony Melia I am 67 years old, Paul had 3 other children, Paula 64, Gregory 62 and Mary 60 we all grew up in Yonkers, NY. Paul's fathers last name was Italia, he was married to Mary Guadigno they had a son Paul, they were divorced and she remarried. I would like to speak to you about your great uncle Paul. Paul was quit a decorated war hero, he was awarded the Distinguished Flying Cross (DFC) twice and the Air Medal twice, he flew 24 missions from England to Germany as a B17 Belly Gunner, please contact me amelia5@sc.rr.com. Thank you great post, I can fill in all your missing peices! Hi FredtheFrench! Sorry this took so long to respond to. I don't really come on this site. I communicated with him through email and came to find that we are not related.